There are no comments for Dancing Through Time. Click here to post the first comment. 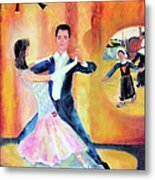 Two elegantly dressed ballroom dancers are in the spotlight in a dance studio, or club along with a reminder of other painted dancers from the past. 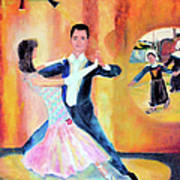 This painting Dancing Through Time by Karen Francis is 40 x 30 inches. 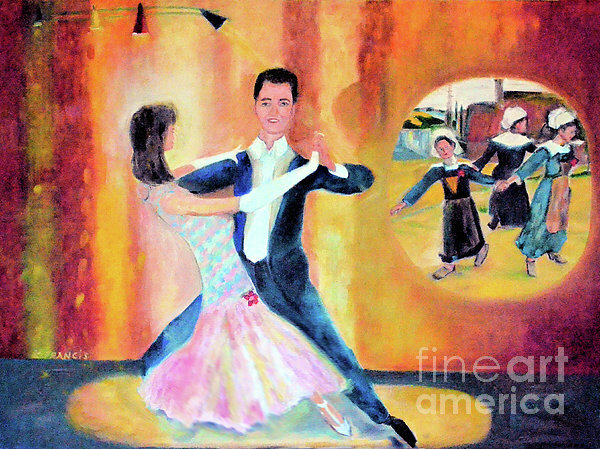 This print is available from Art Promotions on artpro.com, or and through authorized publisher fineartamerica in a variety of sizes and framing options through its secure shopping cart online by credit card or Pay Pal. Tote bags too, perfect for your dance shoes! 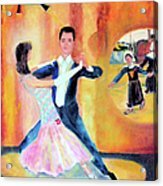 The original painting as shown here, is no longer available, as the male figure has been modified. It has undergone a transformation makeover. The new one will be posted soon hopefully.